Narratologists treat the narrative not in the traditional way, as a fictional representative of life, but as systematic formal construction. The Punjabi novelists have shifted their stance from telling a tale to delineation of character to the depiction of the atmosphere of the mind since the appearance of Sundari (1898) by Bhai Vir Singh. In Section One of the monograph, two chapters deal with modern literary theories and the art-form of the novel. In Section two the narrative modes employed by the Punjabi novelists, during the last one hundred year or so, have been highlighted. At present the Punjabi novel is caught in the crosscurrents of thematic concerns and stylistic approaches. Niranjan Singh Tasneem (b. 1929) retired as Professor of English at Govt. College, Ludhiana (Punjab). Besides Studies in Modern Punjabi Literature (1980) and Qadir Yar – a monograph (1980), he has contributed 8 novels and 3 books of literary criticism to Punjabi literature. He received Shiromani Sahitkar Purskar (Punjab State Award) in 1995 and sahitya Akademi Award in 1999. He is a former fellow of Indian Institute of Advanced Study, Shimla. In Narrative Modes in Novel Dr N.S. Tasneem deals with the development of form in Punjabi from Nanak Singh to Dalip Kaur Tiwana – a period of intense literary activity from the fifties to the nineties of the century. During these five decades the Punjabi writers had to come to terms with extremely turbulent times in the social and political life of the Punjabis. The development in from and content corresponds well with the complexities of life and the introspection that was thus triggered. From the simplistic narratives of naive idealism of Nanak Singh to the incisive meditations of Gurdial Singh and Dalip Kaur Tiwana we have a very significant development in the Punjabi literary discourse. Dr Tasneem has worked as a fellow in the Institute and the present work is the end-product of his fellowship, I am happy to present this monograph to the readers of Indian literature. Narratology denotes a recent concern with narrative in general. It deals especially with the identification of structural elements and their diverse modes of combination, with recurrent narrative devices, and with the analysis of the kinds of discourse by which a narrative gets told. This theory picks up and elaborates upon many topics in traditional treatments of fictional narratives, from Aristotle's Poetics to wayne Booth's The Rhetoric of Fiction, but applies to them concepts and analytic procedures which derive from recent developments in Russian formalism and especially in French structuralism. Narratoglists treat a narrative not in the traditional way, as a fictional representation of life, but as a systematic formal construction. A primary interest of structural narratologists is in the way that narrative discourse fashions a "story" – the mere sequence of events in time-into the organised structure of a literary plot. According to David Lodge-"Narratology or Narrative Grammar is an effort to discover the language of narrative, the underlying system of rules and possibilities of which any narrative parole (text) is the realization." The central focus of the Russian Formalists was not literature per se but literariness, that which makes a given work a 'literary' work. In this sense they sought to uncover the system of the literary discourse, the system that made literature possible. Their interests in texts centred on the functioning of literary devices rather than one content: literariness was to do with a special use of language. Shklovsky's essay "Art as Technique" was one of the first important contributions to the Russian Formalist movement. In it he developed the key notion of 'defamiliarzation'- making strange. What literary language does is to 'make strange' or defamiliarize habituated perceptions and ordinary language. Like Russian Formalism, structuralism believes in the possibility of a 'science' of literature, one based on form rather than content. For structuralism, such a science means it could potentially master and explain the world of signs through exhaustive detailing and analysing of the systems that allowed those signs to speak. A good deal of Anglo-American critical theorizing about the novel, from Percy Lubbock's The Craft of Fiction (1921) to wyne Booth's The Rhetoric of Fiction (1961) was implicitly, if unconsciously, based on the same distinction between fabula and sjuzhet, between 'story' and of telling it' Two recent books which have made particularly valuable contributions in this respect are Seymour Chatman (1978) and the more narrowly focused work of Dorrit Cohn (1978). In his distinction between metaphor work metonymy, Jakobson (1965) provided a key to understaniding how the realistic novel contrives to build up a pattern of understanding how the realistic novel contrives to build up a pattern of equivalences without violating its illusion of life. The argument is briefly as follows: "Metaphor and metonymy are both figures of equivalence, but generated by different processes, metaphor according to similarity between things otherwise different, metonymy according to continuity of association between part and whole, cause and effect, thing and attribute." The function of narratives is not to 'represent', it is to constitute a spectacle still very enigmatic for us but in any case not of a mimetic order. The 'reality' of a sequence lies not in the 'natural' succession of the actions composing it but in the logic these exposed, risked and satisfied. Putting it another way, one could say that the origin of a sequence is not the observation of reality, but the need to vary and transcend the first form given by man, namely repetition: a sequence is essentially a whole within which nothing is repeated. Narrative does not show, does not imitate; the passion which may excite us in reading a novel is not that of a 'vision' (in actual fact, we do not 'see' anything). Rather it is that of meaning, that of a higher order of relation which also has its emotions, its hopes, its dangers, its triumphs. Homologically, narrative as subject is the point of communication: there is a donor of the narrative and a receiver of the narrative. Regarding the donor of the narrative, three conceptions seem to have been formulated. The first holds that a narrative emanates from a person (in the fully psychological sense of the term). The second conception regards the narrator as a sort of omniscient, apparently impersonal, consciousness that tells the story from a superior point of view, that of God: the narrator is at once inside his characters and outside them. The third and most recent conception (Henry James, Sartre) decrees that the narrator must limit his narrative to what the characters can observe or know. Here it must be pointed out that narrator of that narrative. In the words of J. Lacan: who speaks (in the narrative) is not who writes (in real life) and who writes is not who is. 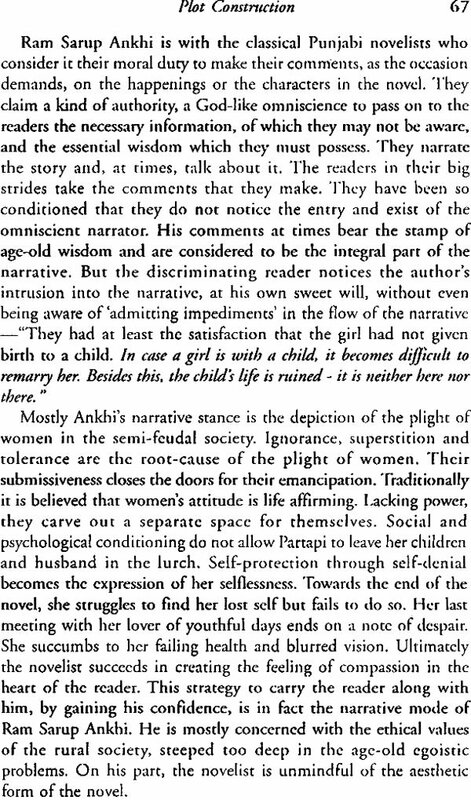 In the light of the foregoing observations, I have reassessed Punjabi novel from the point of view of narrative modes which the novelists have employed from time to time. The Punjabi novel, in the main, has been occupied with the presentation of the outer life of men and women. The story is generally told from the omniscient point of view. It is supposed to have a conscious moral purpose also. Nanak Singh set the pattern by presenting romantic idealism from the omniscient point of view. In a way. Jaswant singh Kanwal, Gurmukh Singh Jeet, surinder singh Johar, Ram Sarup Ankhi, Om Parkash Gasso, Basant Kumar Rattan, Inder Singh Khamosh, Safinder Singh,Uppal and some others have taken care of the contents, without paying much attention to the form. Not that they are merely indifferent to the narrative devices, rather they ate disdainful of formalism and structuralism and are content with the employement of various techniques for telling their tales. The realists like Surinder Singh Narula, Sohan Singh Seetal, Baldev Singh, Avtar Singh Billing, Karamjit Singh Aujla, Mitter Sain Meet and some others have written novels with a point of view. They either present the seamy side of life of the sordid aspects of existence. They do create narrative patterns in their works but they are in a hurry to convey their message and do not pause for viewing things from an aesthetic distance. A frog jumping into the stillness of an ancient pond.